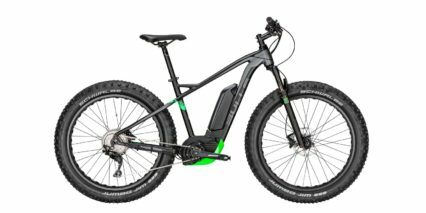 The BULLS SIX50 EVO AM 4 is an all-mountain electric bike running the proven Bosch CX motor, 2.6″ plus sized tires, and a whole slew of premium components. Aside from the Fox Factory shocks, Magura MT Trail hydraulic disc brakes, and Shimano XTR 11-speed drivetrain, one of the things that really differentiates this model from other leading products for 2018 is Bosch Powertube battery pack. In my opinion, Bulls has always done a great job of keeping their motor and battery systems tight and beautiful… but the Powertube is on a whole new level. 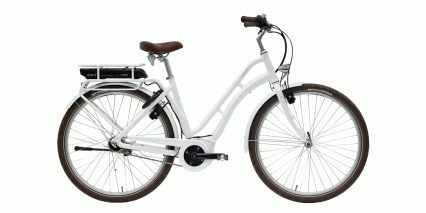 You literally cannot see the pack because it’s contained inside the downtube, protected by a matching alloy shield on the base. Its weight is positioned lower and more centrally than almost any external Powerpack design I have seen, aside from a few unique implementations by Cannondale, and Lapierre. 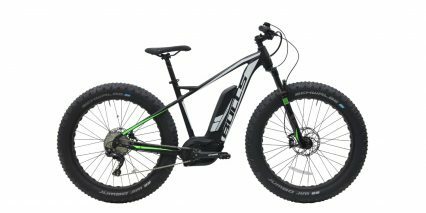 Personally, I prefer the look of the AM 4 and other Powertube ebikes, but have noticed that it adds about one pound of additional weight. It’s also less swappable, because the lower shield (which matches the frame color) is screwed onto the battery pack itself. You can still remove the pack for independent charging and safe storage, but I’m not sure how easily you could rent or borrow another pack on location… perhaps if you brought your shield along to re-attach? Anyway, it’s exciting to see and experience the latest and greatest from a leading brand. Bulls has been selling in the USA since 2016 now and has a growing network of shops who will fit, service, and warranty the products. This particular model comes in three frame sizes so you can dial in fit, the top tube is angled to reduce standover height, and the seat post dropper works flawlessly. 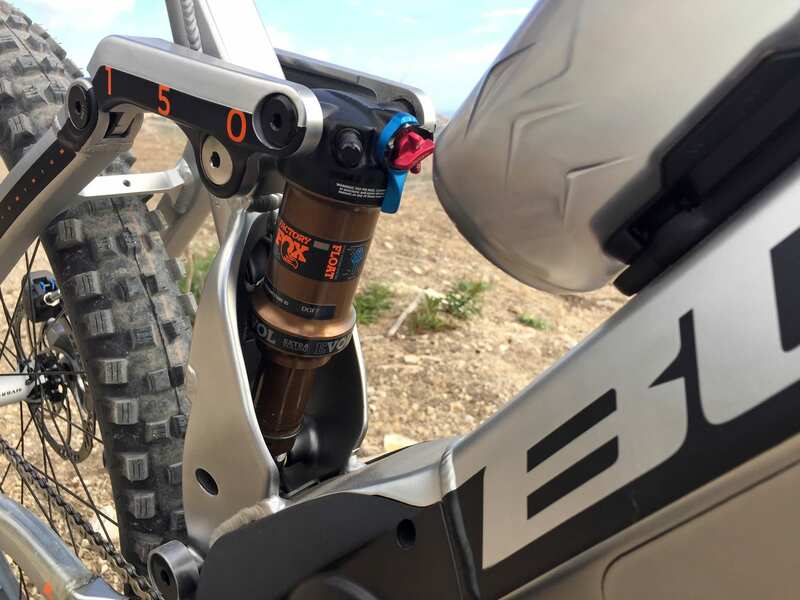 Where many competing full suspension ebikes struggle to fit on bottle cage bosses, Bulls has gone above and beyond with the magnetic MonkeyLink downtube mount and two wired-in MonkeyLink light interfaces. 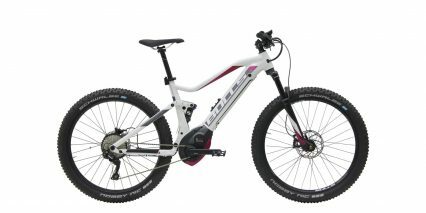 The stem and seat post clamp work with a whole range of accessories, including a rear fender option. In short, you’re getting an extremely rugged, capable, and beautiful electric bike here. And Bulls offers a specced-down model called the EVO AM 3 for people who want to save some coin and are okay with RockShox suspension and a Shimano XT drivetrain. It uses the same battery setup and motor as the AM 4 but comes in dark grey and neon green vs. the exposed silver Aluminum here. 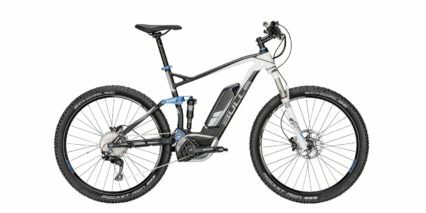 Driving this bike is a powerful mid-motor from Bosch called the Performance Line CX. 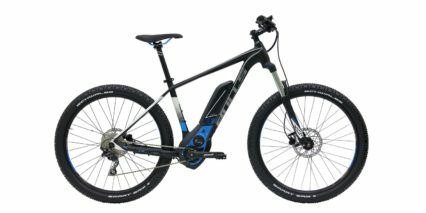 It offers 350 to 570 watts of power output and up to 75 Newton meters of torque depending on the level of assist being used, and how hard you pedal. 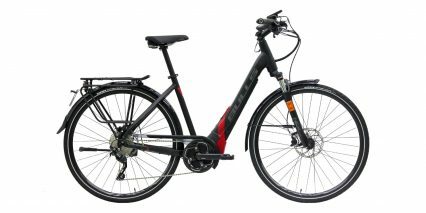 If you live in Europe, this system may be rated at 250 to 500 watts and limited to 25 km/h vs. 20 mph (32 km/h), but it still delivers high torque. 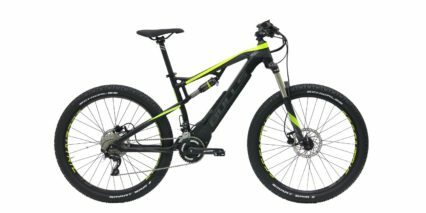 The motor controller listens to rear wheel speed using a magnet and electronic sensor on the left chain stay, pedal cadence, and pedal torque, over 1,000 times per second. 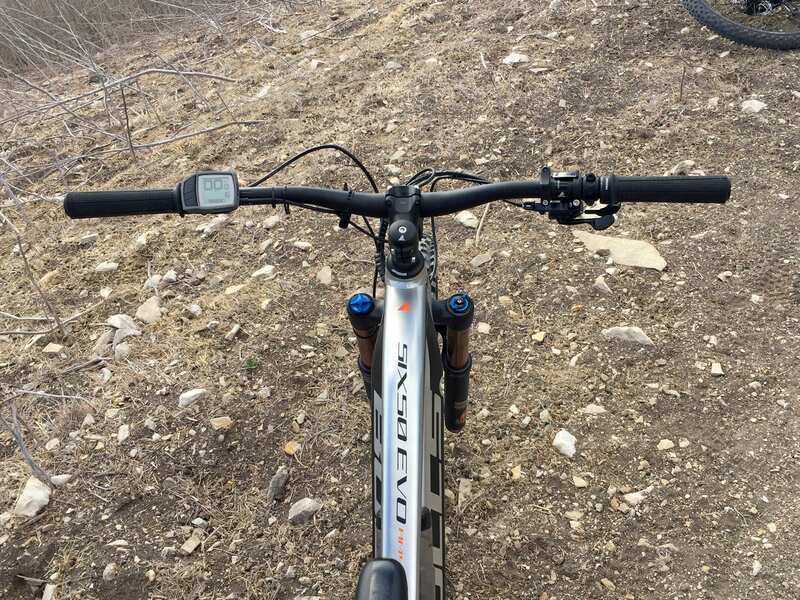 These signals allow it to start and stop near-instantly to keep you in control… which is especially important in a mountain bike setting. Beyond assistance, this motor controller is also listening for tension changes in the chain, resulting from gear shifting. When it senses these inputs, it tells the motor to ease off in order to reduce mashing and gear grinding. It’s not a perfect system, and you can help it by reducing force on the pedals yourself as you shift gears, but it’s something that only Bosch is really doing right now. There have been a few hardware driven shift detection designs over the years (from Impulse and Bafang partners) but the software solution that Bosch has developed is a real differentiator. I love how Bulls has angled the motor and tucked it up into the frame to maximize ground clearance and shorten the effective chain stay length for a snapper ride feel. 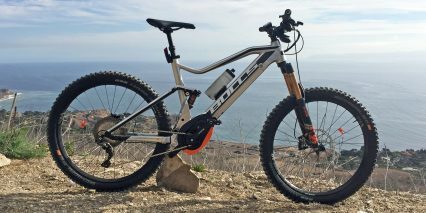 Visually, the motor doesn’t blend into the frame as nicely as if it had a silver casing, but the neon orange skid plate does set off the fork sticker and label accents around the frame and tires. 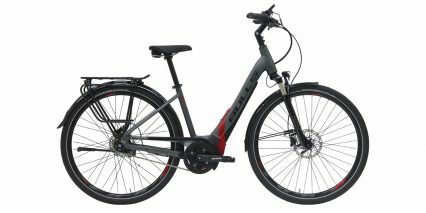 This motor spins a single chainring with 15 teeth, the second smallest that Bosch supports, to maximize starting and climbing power while allowing for high top speeds. 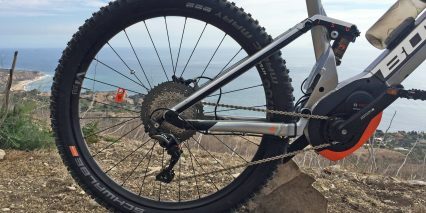 It’s equivalent to a traditional 38 tooth sprocket and spins at 2.5 revolutions for each crank revolution. 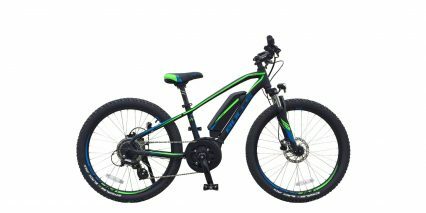 The motor has a reduction gear to make this happen, and it provides a mechanical advantage and increased chain grab, but also increases friction when pedaling unassisted or above the supported max speed. 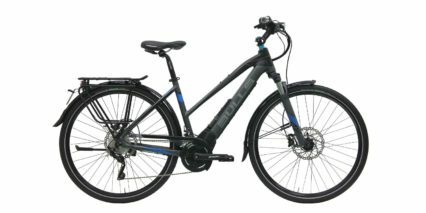 You still freewheel and coast without friction, and I have easily pedaled up to 30+ miles per hour on paved streets, but it is a difference in design compared to most other high-end mid motors from Shimano, Yamaha, and Brose right now. 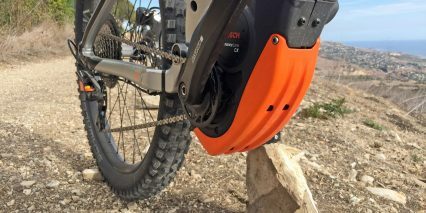 The Bosch CX unit is also the most power hungry and loudest of the Bosch lineup and it weighs a bit more at 8.8 lbs. 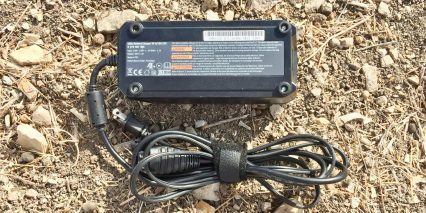 But again, that weight is positioned very low and centered along with the battery pack for optimal balance and stability. Both of these parts are sprung and both are easily replaceable through Bulls if you experience some sort of failure or damage. 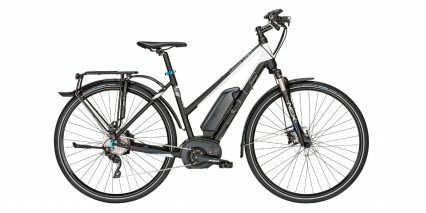 Powering the bike is Bosch’s brand new Powertube 500 which offers 36 volts x 13.4 amp hours for a total of 482.4 watt hours of capacity. 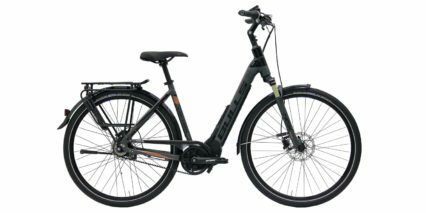 Even though this design is relatively new, I trust that it will be reliable because Bosch has an excellent track record with their external Powerpack 400 and 500 models, since 2013 in the USA. 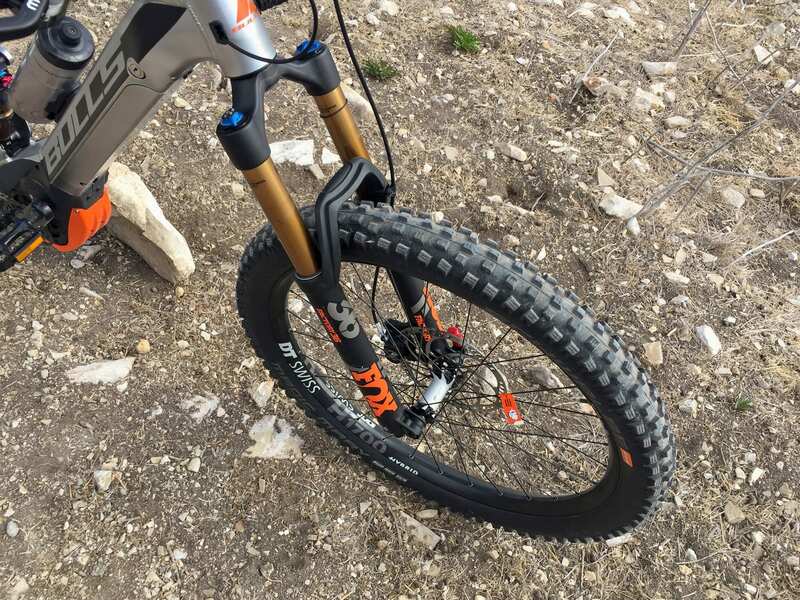 There’s no carry loop at the top or side of the new Powertube, which means you have to use extra care connecting and disconnecting it from the frame. I believe it still has a 5-LED battery indicator on the end (near the charging port) but I wasn’t able to get it to light up during the review video. The charging port of the battery is replicated on the left side of the bike frame, near the base of the downtube, so you can charge the bike without removing the battery every time. The thing is, this port is located very near the left crank arm and I could imagine a snag or break if you’re charging and bump the pedals… it also seemed like the protective rubber cap for this port didn’t seat as easily as some competing designs. 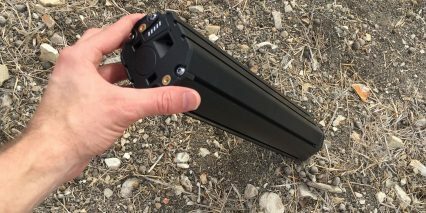 The Powertube battery pack requires a bit of extra flexibility and patience to remove from the frame. First, you have to insert the key and unlock it, then the pack sort of pops out (downwards) half an inch near the head tube. At this, point the pack is unlocked but it won’t come out completely. 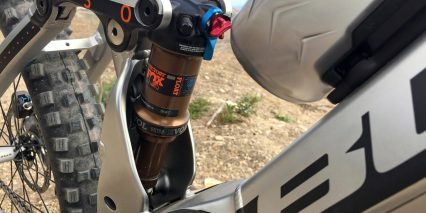 To fully release it, you have to press this little plastic button inside the crack, all while trying to balance the bike frame because there’s no kickstand. I have relatively small fingers, so it wasn’t too difficult, but I wasn’t wearing gloves and I had the bike laid down on its left side to perform all of this. 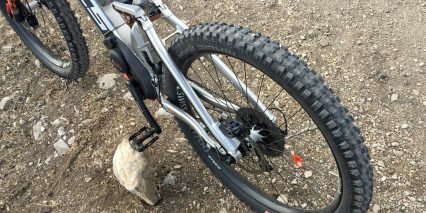 Once you actually press the button, the pack is completely free at the top and will swing down towards the front tire. 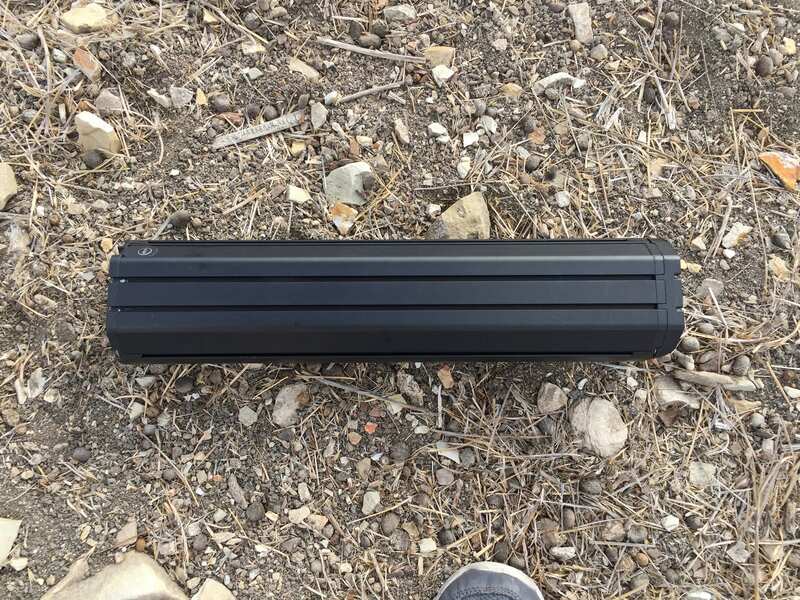 It weighs about seven pounds total, with the attached metal shield, so expect a bit of weight and please be careful not to drop the battery because they are like $900 to replace. 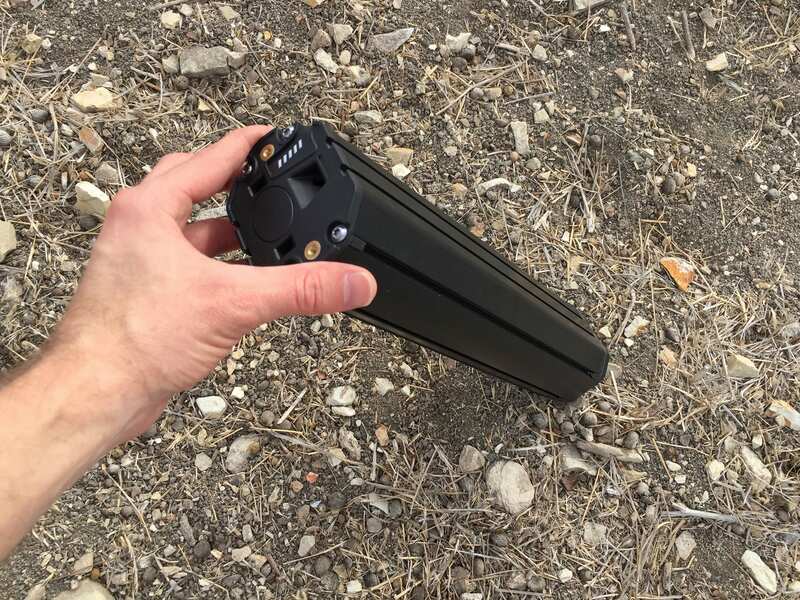 Again, the Powertube battery doesn’t have a handle built in, and with the metal shield it weighs more than the older Powerpack… and, since it’s coming down vs. resting as you lift up, it just seems more precarious. Perhaps that is why Bosch encased the Powertube itself in an Aluminum alloy box. 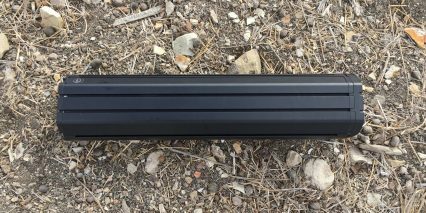 Anyway, to best care for the Lithium-ion cells that are packed inside the Powertube, I have heard that you should avoid storing it in extreme heat or cold, and that you can leave it around 50% full for long periods of disuse vs. completely full or empty. Charging the pack is fast and easy with the 4 Amp Bosch charger. It is one of my favorite chargers because it is so compact and lightweight at ~1.7 lbs. 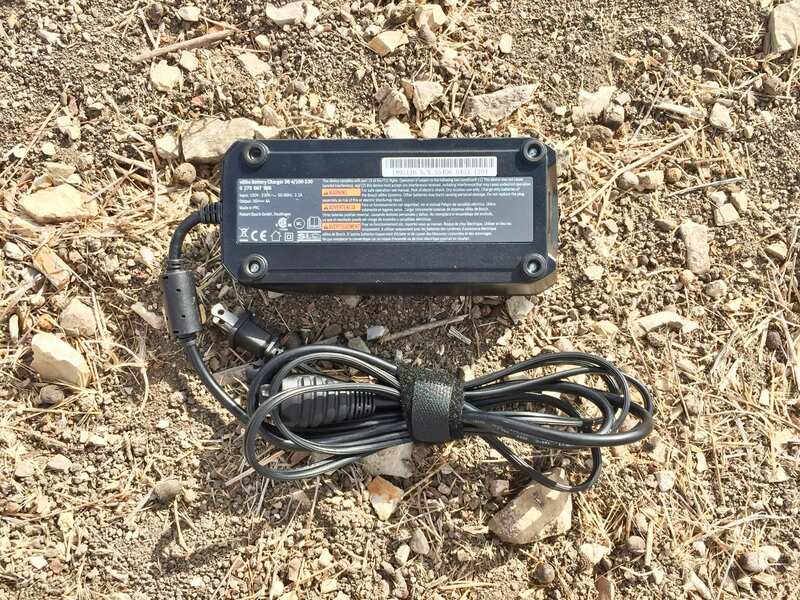 You will probably have better luck sticking this charger into a backpack than trying to bring along a second Powertube battery to extend range. 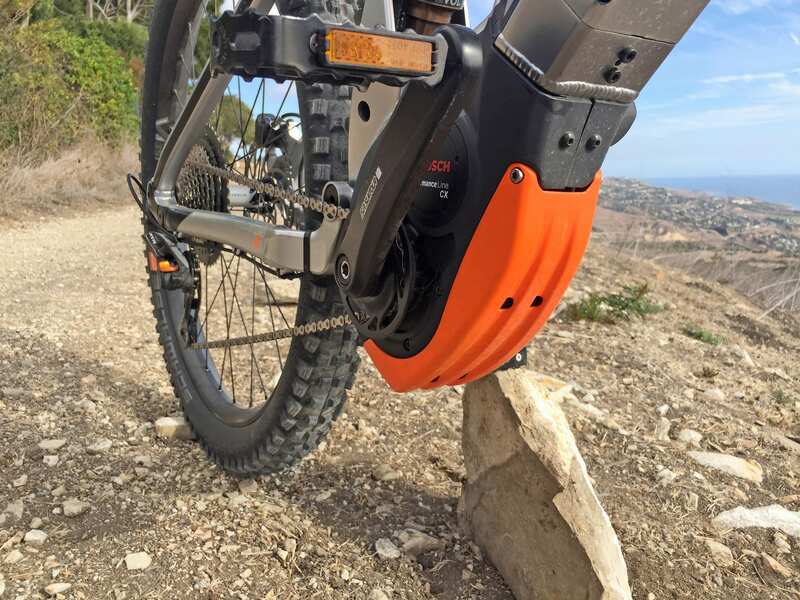 Bosch does offer a compact travel charger that delivers 2 Amps, but it’s only 0.5 lbs lighter and just a little bit slimmer, so I’d probably just stick with the original. In conclusion, I feel that the Powertube battery offers a mixed bag of benefits and trade-offs. It’s hidden, positioned low, doesn’t rattle, and offers a relatively high capacity, but is heavy and less easy to swap and use with a second pack because of the screwed-on shield design. 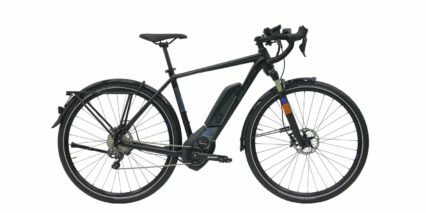 When I first learned about the Powertube concept, I was excited that fellow cyclists might not notice that I was riding an electric bike given how hidden the battery is, but the color scheme and paint job on the AM4 just seems to draw attention to the mid-motor, which is still a bit large, especially without a normal sized chainring to block it from the right. 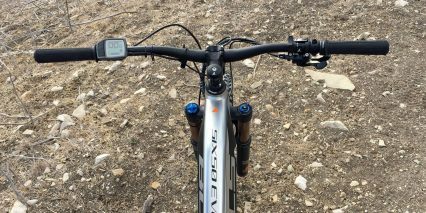 Operating this bike is easy because the display panel is so simple, and positioned within reach of the left grip. Once the battery pack has been charged and mounted, just press the power button along the top edge of the Bosch Purion display panel. 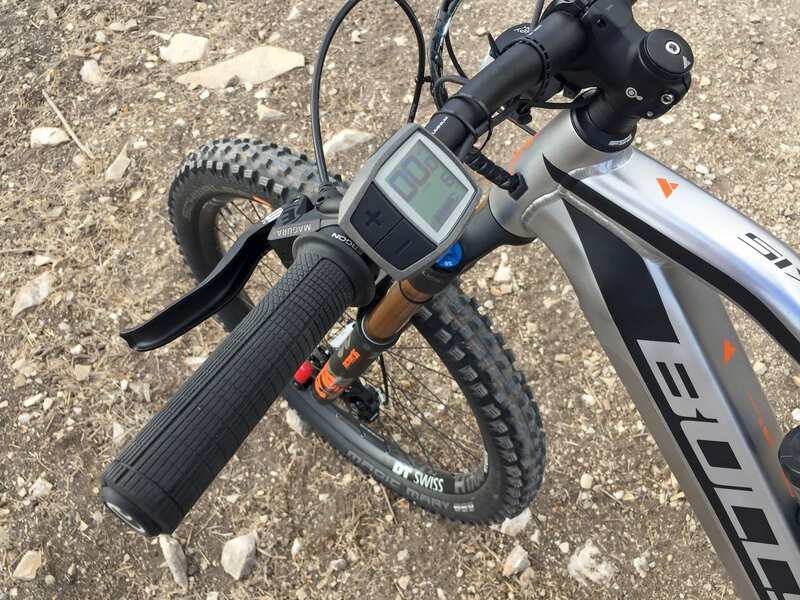 The LCD screen blinks to life quickly and shows your current speed, level of assist, and a basic 5-bar battery infographic near the bottom. You can change units by holding the minus button and tapping power (going from mph to km/hr) and begin to adjust assist levels by clicking the + and – keys individually. It’s really that simple, pressing plus lets you navigate from Off, to Eco, Tour, eMTB, and Turbo. 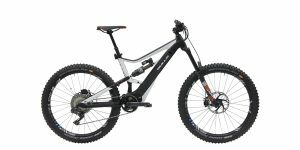 The higher you go, the more energy the motor will expend and the faster you can go. 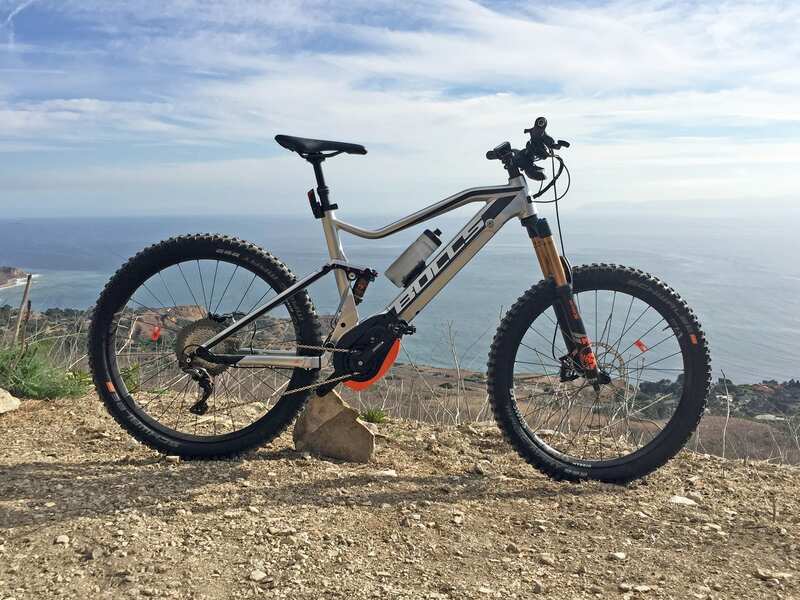 I usually ride in Eco and Tour for Cross Country and on-road sections, but eMTB has quickly become a favorite for trail and all-mountain riding. 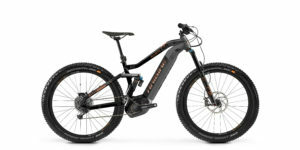 This mode provides 120% to 300% power based primarily on pedal torque. 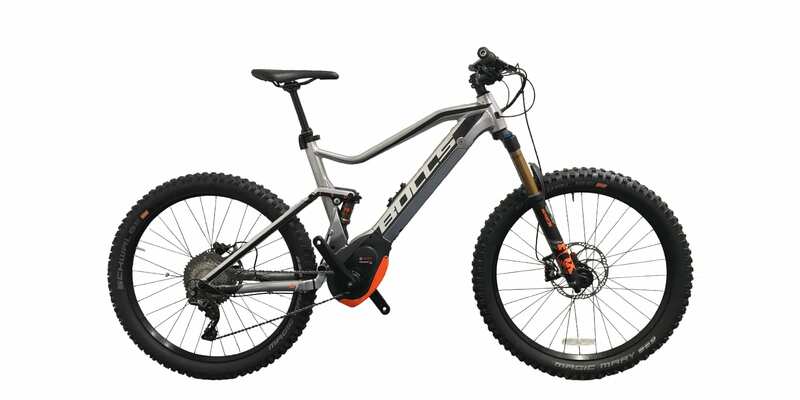 It was designed by Bosch with the help of professional mountain bikers and is amazingly natural. 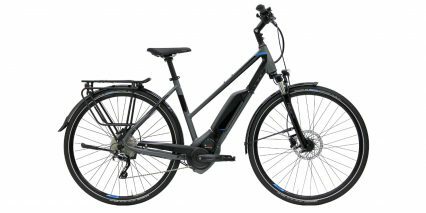 Compared to many other single-setting electric bike modes I have tried, this one feels the most predictable and responsive. Sometimes, I feel that torque sensors make you work too hard, and conversely, I don’t always want to be getting Turbo level performance. 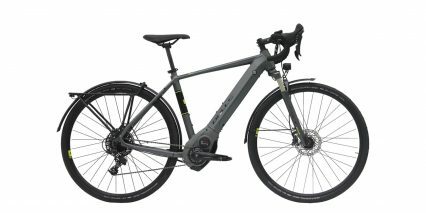 As someone with sensitive knees, I want to avoid straining myself when going from flats or descents to climbs (as was done in the adventure ride portion of this video review), especially with a heavier bike. 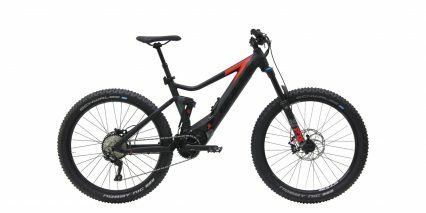 the eMTB setting offers a smooth ramp of power, and allows you to focus more on shifting gears, pedaling, maneuvering the frame, and steering. And, with a wide range of 11 gears offering 11 to 46 tooth sprockets, there is plenty of shifting to be done here. The drivetrain is really unique on the SIX50 EVO AM4 in that it offers an upgraded XTR derailleur vs. the standard XT. 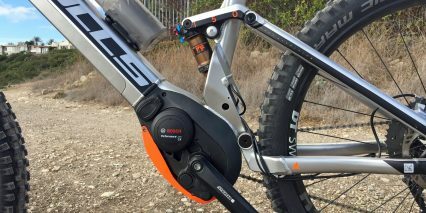 It still has the tucked in Shadow derailleur and the Plus one-way clutch system. 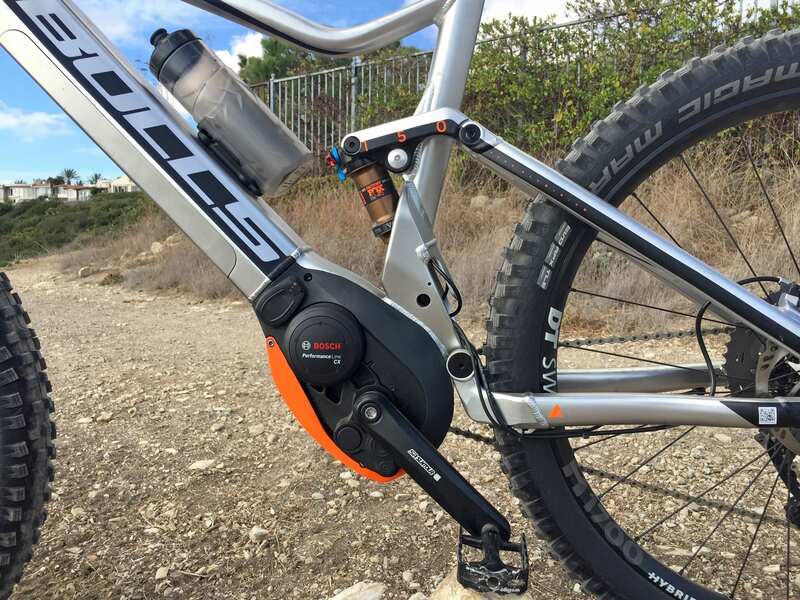 The clutch is a little orange lever that you can click up to tighten the derailleur spring and reduce bouncing for rough sections of trail. 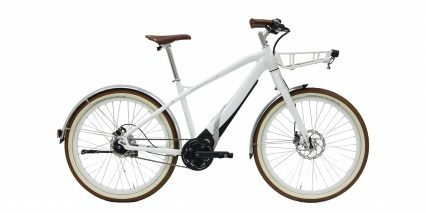 Most of the mid-drive electric bikes I have seen in recent years are going with one-by drivetrains and it makes a lot of sense to me. Coming back to the display, you can get feedback about trip distance and odometer by holding the minus button, and then eventually you’ll get to a dynamic range menu. 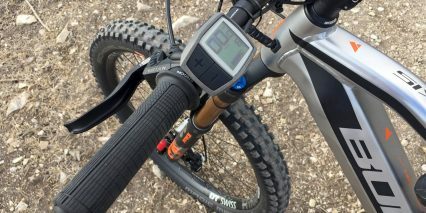 To me, this menu is much more useful than the battery graphic with 20% increments, because it factors in your last mile of riding and the assist level in use to give you a realtime estimate. Another useful feature on this display is the walk mode button positioned along the lower edge. You can press this and then hold the + button to have the bike push itself forward slowly. 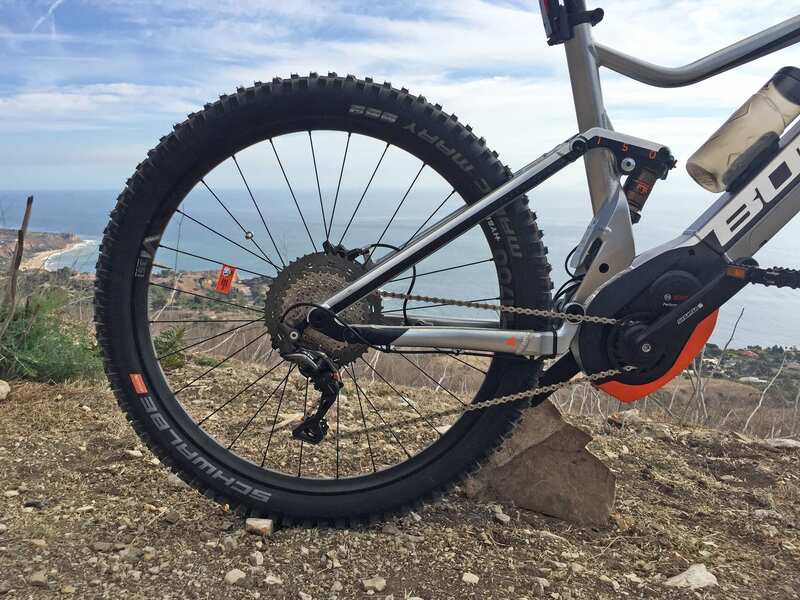 It’s great for climbing steep sections that maybe you didn’t feel comfortable riding, or if you get hurt and have to walk out, or if you get a flat tire etc. And with the integrated MonkeyLink light connection points, you can control the lights with the same Purion display pad by holding the + button for a couple of seconds when the display has been turned on. It’s awesome to be able to power LED lights from the same main battery pack as the bike and I loved how quick and easy it was to connect and disconnect the sample lights on this bike but did notice that the headlight mount seemed fixed… so you might not be able to angle it up and down as you would with most other headlights. Note that the display itself is faintly backlit for use at night, and there is a Micro-USB port on the right edge, but this is only for diagnostics. Compared to the larger Intuvia display, the Purion has harder buttons that pivot in towards the screen, it is not removable, and does not swivel to reduce glare, but it is compact and tough. 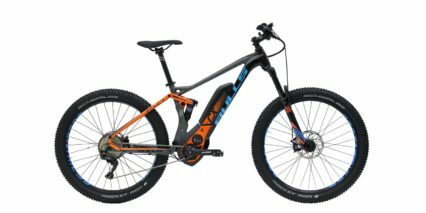 I love the approach that Moustache has taken with their motor and battery integration, it’s not just on the Samedi 27 Trail 8, but also with the Trail 6 and some of their other crossover models. I trust the Bosch motor system because many shops have told me that they don’t need to do as many repairs on it, and I have heard that Bosch offers great support (as a part of the two-year comprehensive warranty here). 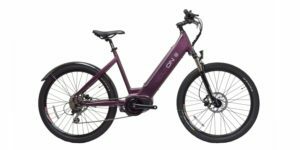 This ebike isn’t especially cheap, but it’s a higher-end offering with premium hardware… for what you get, I actually think it’s a great value. A few other things I noticed and appreciated during this review were the adjustable-reach brake levers, locking ribbed grips with matching red hardware. 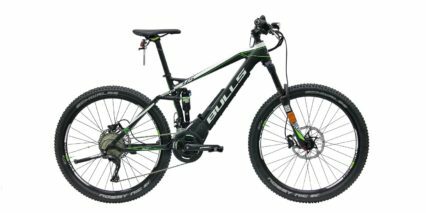 The sturdy thru-axles with quick release for easy transport and trail maintenance, the two-way high gear shifter and multi-shift low gear shifter (this is a Shimano SLX hardware part), and the extra rubberized slap guard and channel on the right chainstay. 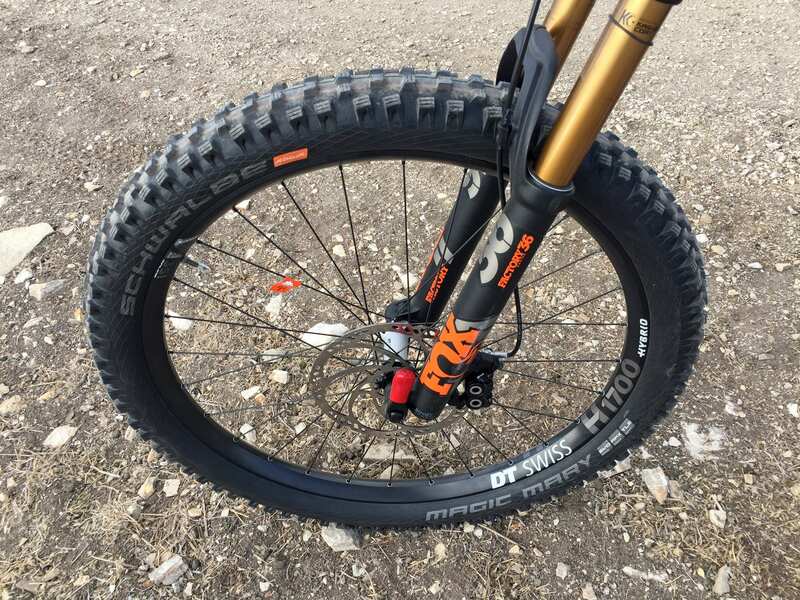 The rims are a bit wider, at 35 mm, to support the plus sized tires and the stock pedals are wide and grippy… not the cheap cage style pedals I see a lot on other bikes. 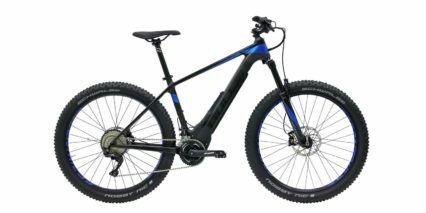 Some e-mountain bikes don’t include pedals at all. It seems like Moustache is pushing the envelope and thinking differently, not always just about aesthetics or weight savings, but what will work best for their specific build. 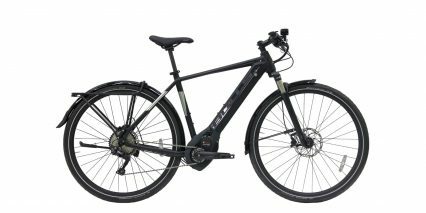 A high torque motor with sturdy reliable drivetrain in this case. 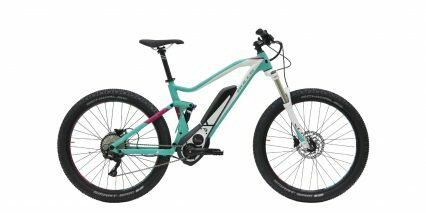 Depending on the frame size you select, it sounds like the handlebar length and seat post dropper may change a bit, going from 60 mm to 100 mm or 125 mm on the post to accommodate taller riders. 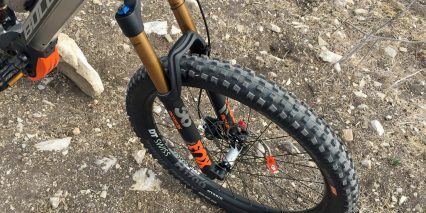 I’d like to thank Moustache and Propel bikes for partnering with me on this post, Chris Nolte met me with a couple of bikes so we could compare back to back and it’s always fun to have a shops perspective since he gets to hear from actual customers. 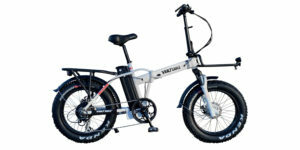 As always, I welcome your comments below and invite you to connect directly with others in the Moustach Ebike Forums. 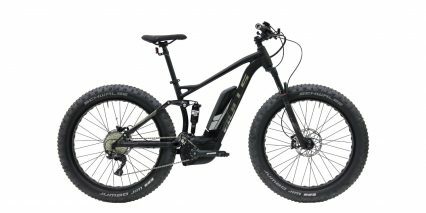 I was super excited to review the new Powertube electric bikes from Bulls and the SIX50 EVO AM 4 is their trophy model. It uses the best parts, and looks very cool… but isn’t as cool as the AM 3 to me because of how the black motor casing stands out. 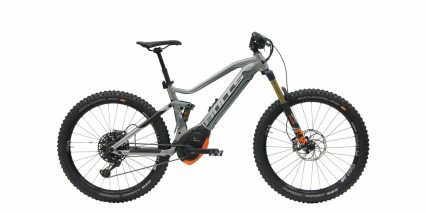 I love Fox suspension, but I’m not advanced enough to appreciate the XTR drivetrain here vs. the XT on the AM3. I also have limited funds, and would probably not pay extra for this bike, even though I had a blast riding it! It was surprising to me that this bike and the EVO AM 3 weigh over 55 lbs, because their are other full suspension bikes with longer travel that weigh closer to 50… but maybe the wider stanchions on the Fox Float 36 fork and the little alloy stanchion shield for the rear shock, combined with the sturdier downtube build, and plus sized tires just all adds up. 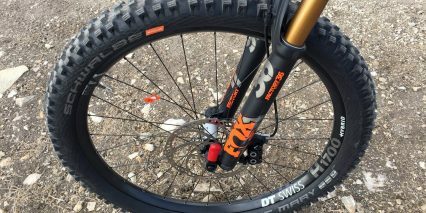 Note that both suspension stanchions are anodized with the Fox Kashima coating to slide smoothly and be tough, both wheels have thru-axles with quick release, and the saddle and grips are upgraded to Fizik and Ergon respectively. I really like the grips, they’re more traditional flats but have a nice rubber blocker on the inside to protect the inside of your hand… but aren’t so high that they prohibit you from reaching the Purion buttons, seat post dropper, or trigger shifters. 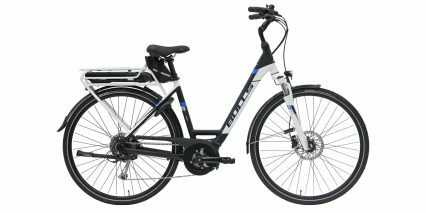 I noticed that the shifters were a bit more sturdy on this bike, they seemed to be made of metal and offered two-way action and multi-shift for going to lower gears but also felt more firm than SLX. Big thanks to Bulls for inviting me out to review several models back to back and partnering with me on these posts. 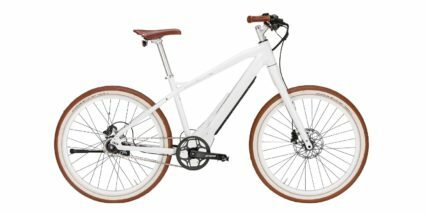 I am impressed with the progress Bosch has made in terms of battery design and I can definitely see the appeal of this new hidden concept. 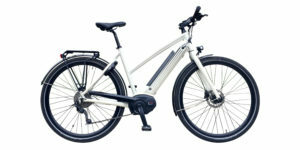 Feel free to post your questions and feedback in the comment section below or connect with others and share your own pictures and videos in the Bulls Ebike Forums. I genuinely don’t get it. 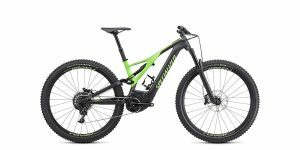 Why does this bike even exist? 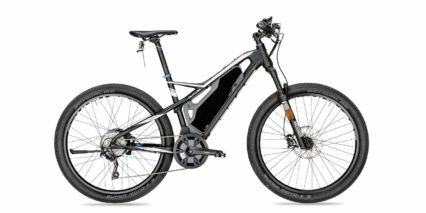 It’s one of the most expensive electric bikes out there and it has almost the least powerful motor they make. It’s not just this one either. It’s almost all of them (on this website) over the $4000. 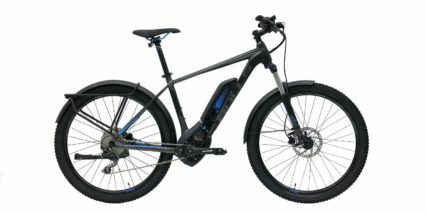 this bike, with puny 350W motor that only draws 36v, for instance won’t even get a grown man up an average paved hill anywhere near my area (North GA in the foothills of the Appalachian mountains). Now consider how much of the U.S. is covered by the Rocky Mountains and the Appalachian mountains and you gotta wonder…. 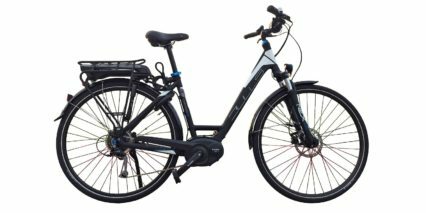 why does this bike with this puny motor exist. There’s literally NO WAY this thing is gonna get anyone large enough it to ride it to the top of a mountain. 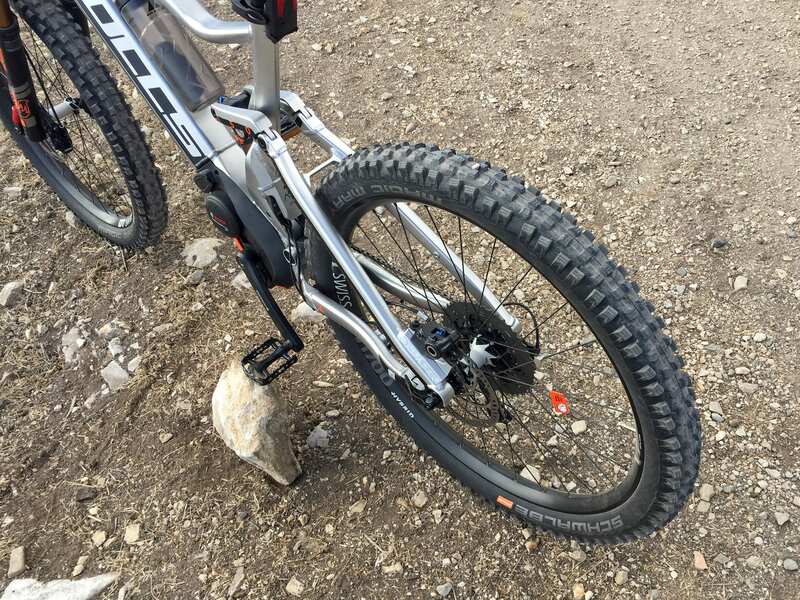 This is especially puzzling for off road bicycles. 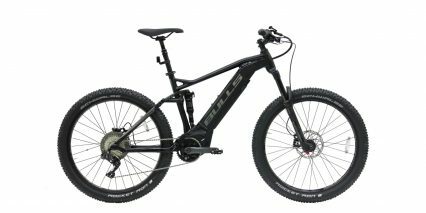 Federal law limits (only for people with out drivers licenses on public roads), the power of motor but that doesn’t matter for an off road bike like this one. Until I came here I thought a 1500W motor was the low end standard for an electric MTB, with many people using a 3000W mid drive. 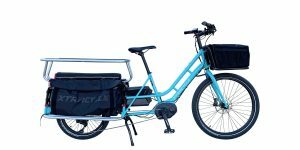 I been browsing this website for an hour and seen a single bike with even a 1000W motor. That’s the legal limit for streets with no license here in GA btw, but again, when off road it doesn’t matter. Can someone please tell me what I’m missing?